Claudio Dias has followed Dean Snedker from Northampton Town to Spencer Stadium. 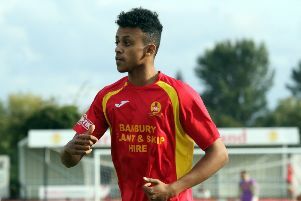 The 19-year-old midfielder, who can also play up front, has joined Banbury United on a month’s loan from the Cobblers. The Portuguese player came through the Northampton Town youth system, having joined the club at under-14 level. He signed a professional deal with the Cobblers in March, prior to making his first team debut against Barnet in the final League Two game of last season. Dias spent a month on loan with Corby Town earlier this season and played for the Steelmen against the Puritans at the Spencer Stadium back in September. He joins Cobblers keeper Dean Snedker who is also currently on loan at United and is expected to go into the squad for Saturday’s game against Weymouth.